Concord, Massachusetts, is a small town of less than 16,000 people and yet it has lots of interesting history, tourist sites to visit, and wonderful natural areas. Previously in this blog I have written about Walden Pond, Great Meadows, and the Ralph Waldo Emerson House . There are many more things to see and good reasons to visit Concord. The Walden Grille has very tasty food at reasonable prices. There are many historic houses and buildings, some open to the public. Yesterday I visited the Concord Museum , which was just a one mile walk from the train depot. It breaks Concord history up into four main sections: native people inhabitation and the Puritans, the Revolutionary War period, the American literary renaissance, and the present. The first three periods are well represented and Emerson's study and the period rooms are a treat. The labels are well written. It was not overpriced at $8 for adult admission. During tourist season Brush Hill Tours offers several low cost bus tours leaving from Boston. Today I took the package to Newport that included visits to the Breakers , Marble House, and a narrated tour along Ocean Drive. The price for the package was $55. This is much less than it would cost to take a Peter Pan bus from Boston, pay for transportation around Newport by trolley, and pay the admissions to the mansions. The company also offers tours to Maine and Plimoth Plantation that are well worth the money. The Breakers and Marble House were built by the Vanderbilt family in the late nineteenth century. They were only used for eight weeks in the summer and were the site of parties that lasted until dawn. Marble House was only used for a few years before Alva Vanderbilt divorced her husband and married one of his friends. She was an early proponent of women's rights although she seems to have been less concerned with the rights of unaffluent women. The Breakers is the larger of the two, but in my eyes, less visually appealing. The Claremont Trio performed the third and final concert in a series of Beethoven Piano Trios this afternoon. 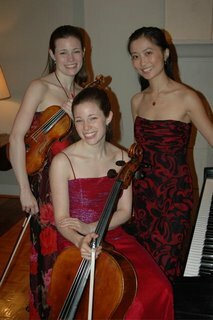 In the 2005-2006 season the Trio performed two Beethoven programs at the Gardner Museum . All three concerts were outstanding. They have established themselves as one of the most popular ensembles at the Gardner. They play with both passion and a very polished sound. The Gore Place mansion and estate has been steadily improving as a tourist destination. The house is made of brick in the federal style, therefore symmetrical with palladian windows and a simple but handsome facade. The inside has many items original to the house including a huge billiards table. Our costumed guide told us that both Christopher and Rebecca Gore played billiards in the early part of the nineteenth century. The Mansion was just their summer home and Rebecca had much input on the architectural plans. The theme of today's tour was the labor required in the upkeep of the house. Rebecca was quite shrewd in her designing the width and placement of of servants' staircases and passage ways. Our docent told us that Jefferson's daughter complained that Montecello was well designed for her father's comfort but that the servants' staircases were too narrow for serving trays. Robert Roberts was a freed slave and the butler for the Gores. He wrote a manual for house servants and later became active in the abolitionist movement. The estate is located on 45 acres on the Watertown/Waltham town line. It has a working farm with special breeds of animals bred to resemble the livestock of the nineteenth century. In the last few years they added a non-sequitor to the farm-a llama. This year comfortable benches and tasteful signage have been added to the grounds. The Gore Place offers concerts in the Mansion itself which are a real treat. They offer several events and special tours during the year.